Therapeutic massage is an important part of your health and wellness plan. It can help you when you are injured, stressed, in chronic pain, or simply in need of a little relaxation & balance. Ongoing massage therapy can help you achieve a preventative approach to your health & well-being. Today massage is thought of as a holistic therapy that complements medical treatment. Physicians across Canada recommend therapeutic massage to help decrease pain, improve range of motion, improve mood, aid in the circulation of blood and lymph flow, reduce muscle and joint soreness and improve sleep. Massage techniques most commonly include pressure and compression, kneading, friction and mobilizing to improve the health and condition of the muscles, tendons, skin, fascia or connective tissue of the body. Massage reduces or eliminates pain. Massage relieves stress, calms the nervous system and promotes a sense of relaxation and well-being. Improves flexibility & range of motion. Prevents and relieves muscles cramps and spasms. Reduces depression, tension and anxiety. Massage therapy can help with pain management in conditions such as arthritis and, sciatica, and muscle spasms. Sports massage is designed to prevent and heal injuries to muscles and tendons. It works to increase muscle temperature and elasticity, reducing muscle soreness and lactic acid while increasing flexibility. 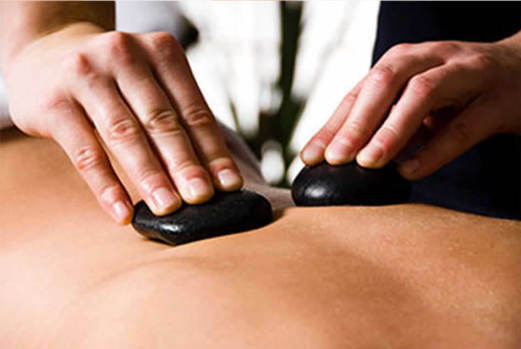 Hot stone massage uses smooth, heated stones, maneuvered over the body to relax and release muscle tension. This modality is a true favorite for those who have a tendency to feel cold due to poor circulation or other conditions. Reiki is a holistic energy based modality. It encourages positive energy flow that enhances balance and harmony within the body. The Reiki practitioner positions her hands over the seven energy centers, moving the energy while the participant (comfortably dressed), completely relaxes. Deep relaxation – Reduced fatigue – A positive impact on mood and performance. A general sense of good health and well-being also assisting emotional release. Strengthens the immune system and encourages positive thinking. Our studio is wheelchair accessible and offers free parking in lot. The first massage studio of it’s kind in Montreal, all our licensed massage therapists are blind.